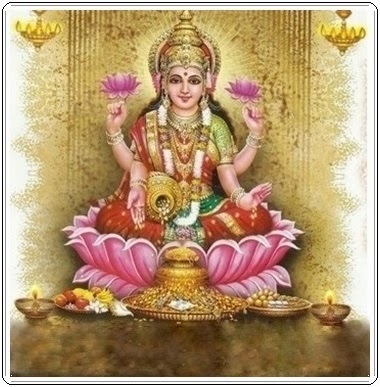 Goddess Lakshmi is one of the most worshiped Deities in Hindu Religion. Goddess Lakshmi is the consort of Maha Vishnu and because of this marriage she is also referred to as Maha Lakshmi and the Empress of Satyug. She also married Sri Rama in her incarnation as Sita and Krishna as Rukmini and Radha. Mahalakshmi is also depicted as Devi in her universal form as Shakti where she kills the Demon Mahishasura. The Goddess is described as eighteen armed bearing string of beads, battle axe, maze, arrow, thunderbolt, lotus, water-pot, cudgel, lance, bow, sword, shield, bell, conch, wine cup, noose, trident and sudarsana. In this form the Goddess is referred to as Ashta Dasa Bhuja Mahalakshmi. Lakshmi is the embodiment of God's superior spiritual feminine energy which purifies, empowers and uplifts the individual. She is also the personification of the Spiritual energy within us and universe called Kundalini. Some Mantras of this Goddess are given below. "Om Shri Maha Lakshmyei Namah"
"Aum Gum Shreem Maha Lakshmiyei Swaha"
"Om Shrim Maha Lakshmiyei Swaha"
"Om aing shreeng hreeng kleeng aing kamalvasinayae swaahaa"
"I bow to Maa Lakshmi who everything, who grant favors to all, who terrorizes the evil and who removes the misery of all. I bow to the divine goddess who is the provider of success and intelligence and the benefactor of both worldly pleasure and freedom. I bow to theUltimate Mother who is without beginning and without end. I surrender to the auspicious Mother who can remove even the greatest of sins. I bow to the great Mother who resides in the hearts of devotees is the goddess of wealth, luxury, beauty, power, generosity and auspiciousness".